Whether you are looking to expand your current warehouse or build a new warehouse to grow your operations, one major decision will what type of racking you need to install to best meet your needs. Pallet racking, in simple terms, is a material storage system that is used to help you better manage your materials or products and keep your warehouse organized. 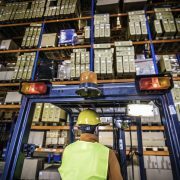 Efficiency and productivity are high on your list as a business owner, so to achieve your goals of productivity, it’s essential to choose the racking system that best suits the needs of your warehouse. 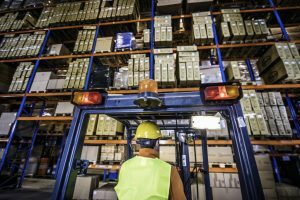 At Cranston Material Handling, we’ve put together a guide to help you get started in finding the best pallet racking for your warehouse operations. What materials or goods will you be storing? What will the floor plan of the warehouse be? What types of forklifts do you use now or what type will you be switching to? How tall do you need the racking to be? What type of inventory management system will work best for your product and operations? After you’ve determined the answers to the above criteria, you can use that information to make an informed decision on what type of pallet racking best suits your operations. This is a high-density storage option that works by placing pallets on nesting carts that glide back on rails. This type of racking can store from two pallets up to six pallets deep on either side of the aisle, with three carts stacked on top of one another. This type of racking works by loading the first pallet in the front, which sits on the top cart. The second pallet is then loaded which pushes the first pallet back, making it great for last-in-first-out inventory. This type of racking requires fewer aisles, reduces picking time, and doesn’t require a special lift to use, making it an excellent option for general warehousing and retail. With this type of racking, the forklift drives into the racking system in order to move the pallet. This type of pallet racking works best for a large volume of inventory with only a few stock keeping units (SKUs) and can help you take full advantage of the storage space in your warehouse. Drive-in racking can be configured in a variety of ways. It can be configured for inventory with First in, First Out or Last In, First Out. Pallet racks can limit the weight and length of items stored due to their vertical uprights. If you have inventory that cannot be easily stored on pallets, cantilever racking can be used. This type of racking is best suited for items that are heavier or longer, such as steel pipes. The items are stored horizontally across multiple arms in the rack. This type of racking is typically a single-deep pallet rack and works best for warehouses that plan to store large amounts of SKUs. Selective pallet racking is one of the more common racking options due to its low cost and easier installation compared to specialized racking systems. At Cranston Material Handling, our team has decades of experience providing high-quality pallet rack systems and material handling solutions to warehouses. We can evaluate your facility and help you find ways to better utilize your space and increase efficiency. With our pallet rack inspection services, we can help you maintain a safe work environment and reduce your liability. Contact Cranston Material Handling today to learn more about our pallet rack options. /wp-content/uploads/2019/02/GettyImages-918698612.jpg 483 724 Cranston Material Handeling Equipment http://cranston-material-handling-equipment.com/wp-content/uploads/2017/03/cr-logo.png Cranston Material Handeling Equipment2019-02-07 20:14:322019-02-08 14:19:31What Are the Different Types of Pallet Racking? Which works best for my Location? Using Floor Tape for a Safer Warehouse How Much Does New Pallet Racking Cost?